Keeping your apartment in Vallejo clean makes you feel good except for one minor detail – the known toxins in the cleaners we use. 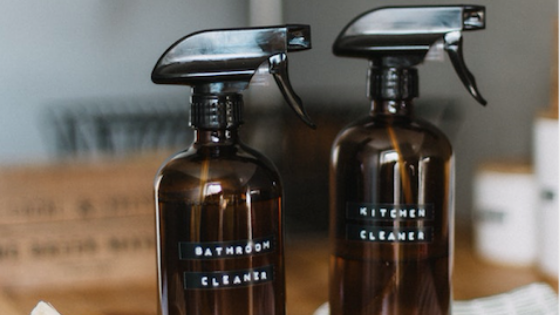 Fortunately, you can easily make your own natural cleaning solutions that have been tried and tested to clean each room of your home without the threat of chemicals. Plus, the ingredients are simple and cheap, so the cleaner saves you money while it saves the environment from pollutants. Here are three simple recipes to clean your entire apartment. In addition to these ingredients, you will also need two spray bottles and one bowl with a secure lid. The following recipes can be used in pretty much any room of your home when used for the intended purpose. This mixture is great for windows, mirrors, toilets and any countertop. It eliminates germs while leaving a sparkling shine. Mix 2 parts vinegar with 1 part water with a few drops of household dish soap. Shake the mixture together, and then it is ready to go. For harder-to-clean areas, you may want to add more vinegar and less water. In fact, for the shower or drains, you can use pure strength vinegar. As a tip, if you like scents, you can also add a few drops of lavender oil or any other homeopathic oil. Sinks, bathtubs, and ovens often need a good scrub once in a while. You can make your own. Add and mix together in a bowl: ¾-cup baking soda, ¼-cup Castile soap and 1 tablespoon water until it forms a nice paste. Once done, it’s ready to be used. If any is left over, simply put the lid on and store. You cannot forget about all the wood in your home, from your couch to your dining table to your side tables. To clean and protect, simply blend together 1 cup of olive oil and 1/2 cup of lemon juice and pour into a spray bottle. Then, use a soft cloth and mist it with the new spray and begin cleaning. The furniture will be left with a clean surface and a beautiful shine. Now that spring is just around the corner, you are equipped with natural cleaning recipes for all your spring cleaning needs. For more tips on Vallejo apartment living, contact us at Bay Village. We are always ready to share our knowledge.